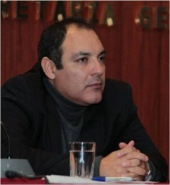 Ricardo Jimenez Ayala is a sociologist at the University of Chile and communicator for the University Inca Garcilaso de la Vega of Peru. Specializing in migration, multiculturalism and Latin American thought. Coordinator of the Socio professional network migrations and the Southern Cone (except Brazil) of the Alliance for Responsible and Sustainable Societies - Alliance-Respons (www.ethica-respons.net/spip.php?page=recherche&lang=en&recherche=ricardo+jimenez). Alliance-Respons is part of Peru Group COP 20, formed in Lima during the 2014 Summit (grupoperucop20.org.pe/). Is a member of the Board of Citizenship and Democracy Institute - ICD Peru (iciudadaniaydemocracia.blogspot.pe/). Academic coordinator of the Diploma on Migration and Public Policy at the University Antonio Ruiz de Montoya - UARM of Peru (www.uarm.edu.pe/Posgrado/diplomados-virtuales/diplomado-en-migraciones-y-politicas-publicas). Member of the Southern Cone Coordination of the process of the World Charter of Migrants (charte-migrants.net/en/). Associated with the Forum for New World Governance - FnWG / World Democratic Forum – WDF (www.world-governance.org/auteur175.html?lang=en).